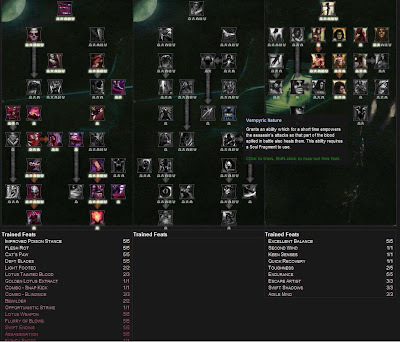 The much anticipated class guide section complete with PVP and PVE builds for each class This time we will look at the Assassin. Assassins are the most lethal killers in Hyboria. Those aspiring to the top of this profession face the most deadly regime of training, discipline, and study, but the ones that survive are executioners supreme. No other class can deliver blows as deadly as an assassin. Their arsenal of lethal combos is complemented by their ability to slip past enemies unseen. Assassins can dual wield daggers with lightning speed and can modify their attacks against specific targets, such as unholy attacks against heavily armored foes, or poison attacks versus mana users. Few can stand against an assassin in combat. 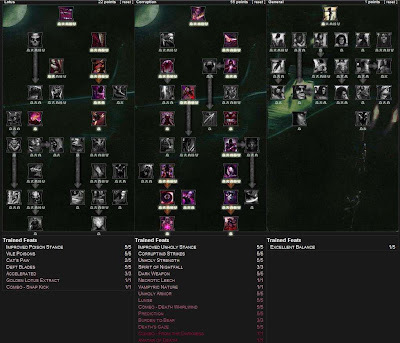 I can't find any solid posts or info on assassin abilities, and hybes is very incomplete. If anyone has anything, I'd be glad to post it. Why would I play this class? Why would I pass on this class? General Assissin Info: The assassin is your typical rogue class. Now, opinions vary greatly. According to some, you are unable to kill players 10 levels below you. Other say Crom himself has an account and he plays an assassin. Assassins are stealthy and deadly. Its real problem is that all the rogue classes are stealthy and deadly. The Ranger can engage from range, the barbarian can engage multiple mobs. Assassin in PvE: Have a tough time. Mob in this game pop up in groups, and this is not a class designed for groups. You just have to pick your battles. Most PvE centered (and most everyone from 1-40ish) go into Lotus for its survivability. After that you can switch into another build to suit your tastes. In groups your usefulness goes up a great deal as you no longer have to worry as much about survivability. dangerous than the other rogue classes, and that is where the problem lies at the moment. Corruption after 40ish is the spec of choice for PvP damage.